You can use gift cards just like cash at certain stores. For example, $100 Macy’s gift card is worth $100 at Macy’s. Using gift cards is not a process of saving money. Saving happens when and how you get gift cards. There are many websites that sell gift cards with discount. The discount rate depends on the popularity of a gift card. Home Depot are often sold with 7% discount, and it is not hard to find 12% off Macy’s gift card. If there are discounted gift cards of stores where you usually shop, why don’t you buy some in advance? Here is the list of websites you can buy gift cards. There are some more, but the lists above are the major websites, and they cover most of it. These websites not only sell but also buy your unwanted gift cards. When you sell gift cards, you have to compromise significantly lower price than face value of your gift card. The rate of discount varies from website to website. Even the same store’s gift card in the same website, the rate is widely different in different times. 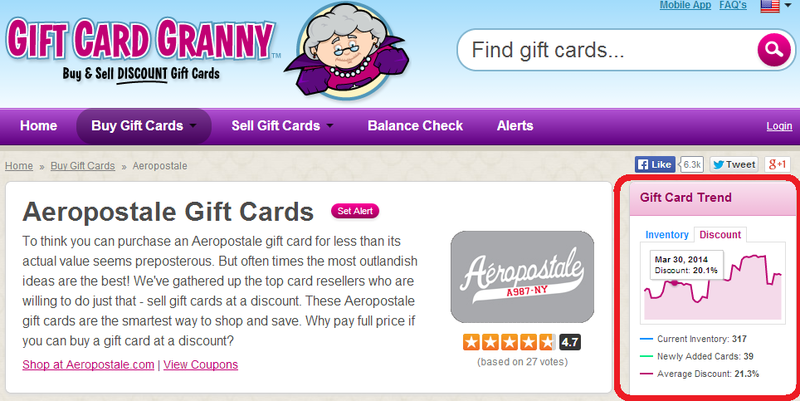 There is a website that make it easier to browse gift card you want at the best price. It is Gift Card Granny. In this website, you can see all available gift cards and websites in one page. Clicking “Discount” sorts by discount and you will see the best deal on the top. Each page has a small graph called “Gift Card Trend”. It is small, but there are lots of vital information you need, such as a discount rate in the last 2 months and the average. You can set up “Gift Card Alerts”. After you set it up, you will receive am email when your favorite store’s gift cards are for sale. Buying a gift card at Target with Target Red Card gives you 5% discount instantly. There are more similar way to buy gift cards in store, but I personally did and verified these ones. They are good ways at a mall. For example, you find a new tablet on sale at BestBuy. It is already a good deal for you. But, to make this a better deal, step out of the store and look for supermarkets or office supply stores and use a credit card for the purchase of a BestBuy gift card. It is quite common that at least one of these store is in a mall. And some gift cards, you can choose the amount. If you don’t want to keep a left-over gift card, get this type. As you see, gift cards are great items for money saving. You may be able to use coupons. If your favorite store has its own reward program, you also get its reward. All these combined, it will be a lot of saving. For more information about gift cards, please read blog archive Gift Card.